Russia's ultimate defense system will dispatch a retaliatory nuclear strike even if the command and communication lines of its Strategic Missile Forces are totally destroyed. The system is called ‘Perimeter,’ and in the U.S. it has been nicknamed ‘Dead Hand’. The main command and control of the strategic missiles is called Kazbek. It is famous for its nuclear briefcase codenamed Cheget. Perimeter is an alternative command system of Russia's nuclear forces. It was designed to automatically control a massive nuclear attack. The development of a system of guaranteed retaliation began in the midst of the Cold War when it became clear that electronic warfare systems, which were being constantly improved, would soon be able to block the regular channels controlling the strategic nuclear forces. A backup method of communication was needed that would guarantee the commands would make it to the launchers. It was then that the idea was conceived to use a missile equipped with a powerful radio transmitter as a communication link. While flying over the Soviet Union, the missile would send the launch command not only to command centres of the strategic missile force, but also directly to the launchers. On August 30, 1974, USSR secret decree № 695-227 ordered Dnepropetrovsk's Yuzhnoe Design Bureau, an intercontinental ballistic missile manufacturer, to create this system. 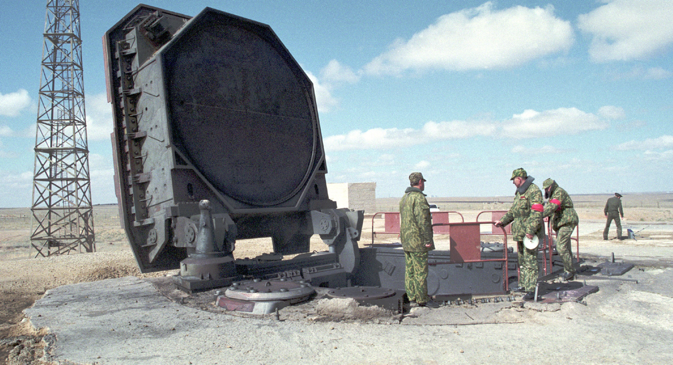 The UR-100UTTKh (NATO designation Spanker) was used as the basis for the system. Flight testing began in 1979, and the first successful launch with the transmitter was on December 26. Tests confirmed all system components of Perimeter could successfully interact, and that the warhead of the command missile would stick to the desired trajectory. In November 1984, the command missile was launched from Polotsk and gave a command to the silo launch facility of an RS-20 ICBM (SS-18 Satan) at Baikonur. The Satan was launched, and after each stage was tested, it was confirmed the warhead landed on the correct quadrant at the Kura test range on Kamchatka peninsula. In January 1985, Perimeter was commissioned. Since then the system has been updated several times, now modern ICBM missiles are used as the command missile. The system is made up of command ballistic missiles. Instead of flying towards the enemy, they fly over Russia, and instead of thermonuclear warheads, they carry transmitters that can send a command to launch all available combat missiles in silos, aircraft, submarines and mobile ground units. The system is fully automated, the human factor is excluded or minimized in it. Russian ICBM missile tests: What lies behind U.S. allegations? The decision to launch command missiles is made by an autonomous control and command system - a complex artificial intelligence system. It receives and analyzes a wide variety of information about seismic activity and radiation, atmospheric pressure, and the intensity of chatter on military radio frequencies. It monitors telemetry from the observation posts of the strategic missile force and data from early warning systems (EWS). If it detects, for example, multiple point sources of powerful ionizing and electromagnetic radiation, it compares them with data on seismic disturbances in the same locations, and makes a decision whether or not there was a massive nuclear strike. In this case, Perimeter would initiate a retaliation strike bypassing even Kazbek. Another scenario is if the country's leadership receives information from the EWS that other countries have launched missiles, it would activate Perimeter. If the shutdown command does not come within a certain amount of time, the system will launch missiles. This eliminates the human factor and ensures there would be a retaliatory strike even if the command and launch teams were completely destroyed. In peacetime, Perimeter is dormant but continues, however, to analyze incoming information. When it is put on high alert or when it receives a warning signal from the EWS, strategic forces, or other systems, a monitoring network of sensors is launched to detect signs of nuclear explosions. Russian leaders have repeatedly assured foreign governments that there is no risk of an accidental or unauthorized missile launch. Before launching, Perimeter checks for four conditions. First, whether there was a nuclear attack. Then it checks the communication link with the General Staff. If there is still a link, the system shuts down. If the General Staff does not respond, Perimeter sends a request to Kazbek. If there is no response there either, the artificial intelligence gives any person in the command bunker the right to make the decision. And only then it starts to act.